I have just arrived home from Europe yesterday! The NZ cold is a bit of a shock to the system but good to be back home, somewhere familiar. Juniors this year was such an unforgettable experience, lots of very high standard racing! 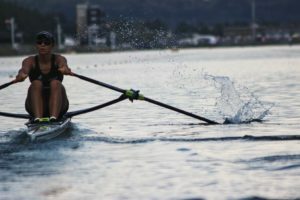 Being in the single taught me a lot about managing myself as a rower and also has given me more drive to work hard for the coming domestic season. Coming away with a fourth place was pretty good, although no silverware. I gave the racing my absolute 100% so couldn’t have asked for anything better. Racing was very challenging but was fantastic experience for the future. Prague was a very beautiful city, so many old buildings and fantastic history. As a team we went for a tour one afternoon and looked around the city which was great. 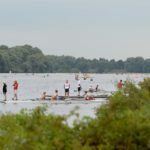 Racice was a fantastic racing venue, a custom rowing course that was only about 2500m long, similar to other venues like Plovdiv. Was a very fast course with 11 world records broken over the course of our regatta which was impressive! It was a rather barren course, the surroundings reminded me of Twizel a bit, very dry environment as I think it was elevated a bit above sea level. 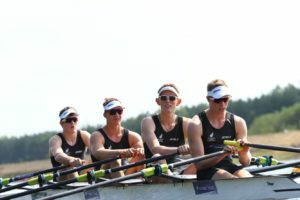 We were very well equipped at the course, with the rowing NZ tent and trailer and ergs, plus a freezer and fans which were very very helpful to combat the heat. There was a heatwave while we were there with temps reaching up to 37 degrees so plenty of ice towels were used to say the least! Contributed well to the European summer glow though which was nice. Hotel Duo where the team stayed was very nice, located on the outskirts of Prague, about a 45 minute bus ride away from the course. Safe to say we got very well acquainted with the bus driver during our stay! While we weren’t training or racing lots of time was spent in the lobby playing cards and drinking raspberry lemonades from the hotel bar. The tour was absolutely fantastic, amazing to be able to visit such a beautiful country, but to also get such good racing experience, and to be surrounded with such a successful team! Everyone got along really well and can’t wait to see everyone around the country this season. Thank you all so much for your fantastic support, gave lots of the badges to the officials at the world champs so they will be treasured by quite a few people all over the place! Being my third and final juniors campaign gives me a little bit of sadness to think that this was my last year as a junior, as all three years have been so fantastic. Being able to have been part of the magic for the past three years has been an absolute honour, and has taught me so much not just about being a successful rower but about being a driven and motivated person. Thank you again for your support, and will hopefully see you all around in the future! 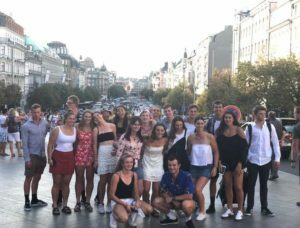 We had one afternoon off to see the sights around Prague. It is a beautiful city rich in history. We travelled as a large group and it was a nice time for the whole squad to relax together before racing began. We decided not to go back out to the course for the opening ceremony as it was logistically too difficult, and too hot! We didn’t want to be standing around for hours the day before racing started. Wednesday afternoon saw the singles heats, and then everyone else raced on Thursday. On Thursday my quad came a comfortable second in the heat to the Swiss so we progressed to the semis on Saturday. It was a surreal experience having my first international race and hearing the Nationalities being called out at the start. All kiwi crews progressed well into their either quarters or A/B semis so everyone was happy. Saturday was challenging weather conditions. It was an extremely strong tail wind. This, combined with the hot water temperature, led to some very fast racing with every single boat class record being broken. Unfortunately a few costly mistakes in our quad’s semi final meant we came 5th and so missed out on the A final. This was incredibly disappointing as we felt we had the potential to make the A final. However we just had to accept that that is racing on the day. 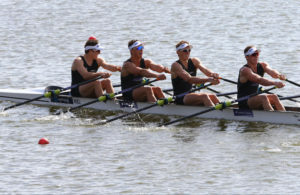 The good news was that all kiwi crews had made either an A or B final and so everyone was racing on Sunday together. This is a fantastic result for our squad. Sunday we lined up for the B final against some still very tough competition. Our aim was to prove that we should have been in the A final. 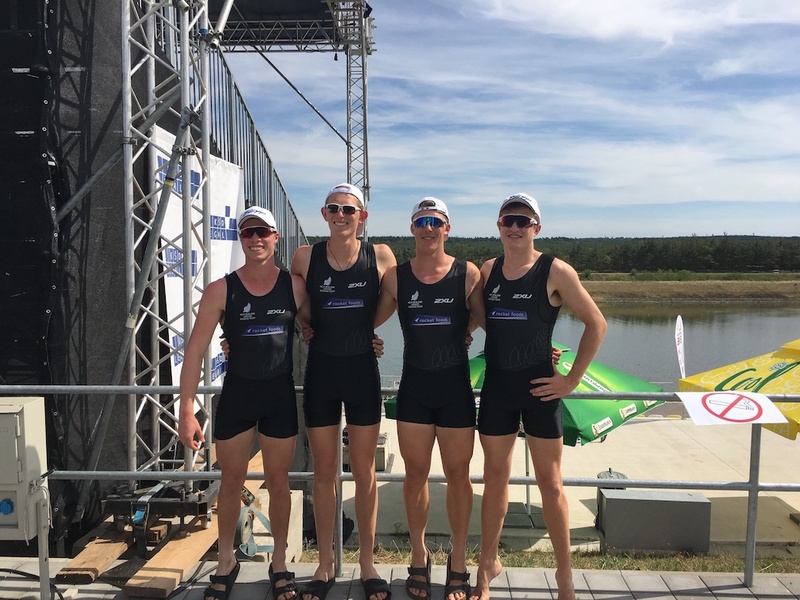 We felt we had a good comfortable race and came through to win the B final in 6.00 minutes which would have placed us 4th in the A final. It was great to celebrate NZ’s three junior medals (silver and two bronzes). Overall the campaign was an immense amount of fun and it leaves me wanting more for the future. I would like to thank everyone for your support along the way. We are still smiling and looking forward to the future. 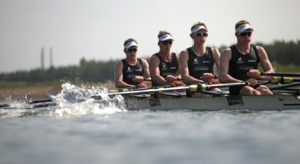 The Mens U19 4x- (Will Thompson, Sam Cummins, Zac Rumble and Harry Church). There is only one week to go before we leave for Racice, Czech Republic. The past two months have gone so fast and have been fantastic. 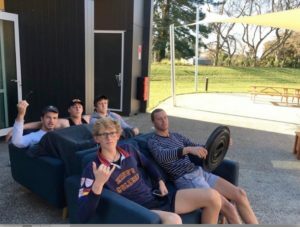 Since my last blog the whole Junior team moved from the Lodge at Lake Karapiro, to the Podium Lodge, which is very close to the Velodrome and St Peters. We love the Podium Lodge, as it has been purpose built for tall athletes. The beds are extra long, and I can actually stand up straight in the shower! There are two rowers per unit, and each room has its own kitchen, TV, and heat pump. The heat pump good these freezing Cambridge mornings. It’s been -3 one morning, with most mornings around zero. We have two extra members of our squad – two goldfish named Rocket and Comet. They live in “the hub”, which is our shared dining room / kitchen. We have settled into a good routine, training both morning and afternoon. We go to school at St Peters every day between 10am and 2pm. 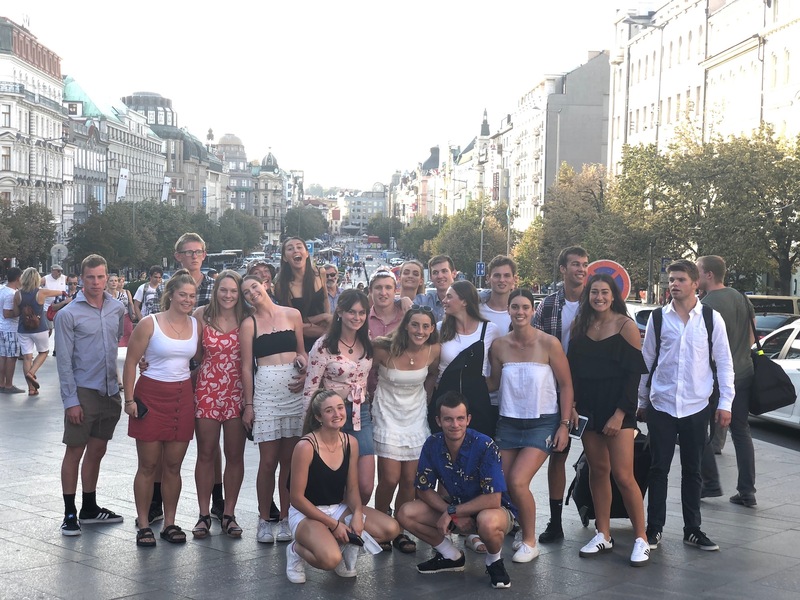 Even though everyone else in on holiday at the moment, the Year 13s in the squad have still had to go to school each day, as we will have three weeks off when we go overseas. The rowing is going really well. 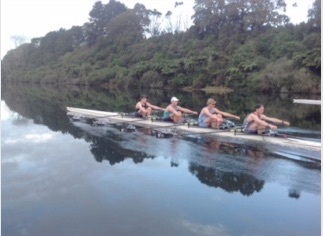 We raced at the winter series a few weeks ago, against the U23s and the NZ University teams. 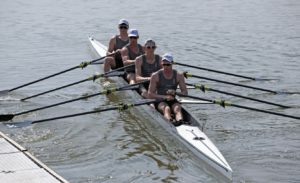 It was a fun three days of racing, and we came away with the fastest overall time of any crew. Here is a photo of us leading the U23 four and quad down the course. Our crew has had a few niggley injuries but generally we are really well and healthy. Duncan, our coach, is super cool, and is strict with hygiene. I now wash my hands like a doctor. He took us for an afternoon snack recently, and we managed to eat 75 chicken wings between five of us (the quad plus James Hall who is in the single). We have Sunday’s off, so last Sunday the whole squad went to Raglan. That was fun. 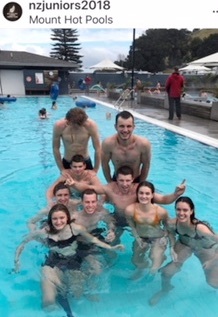 And yesterday we went to Mt Maunganui for a walk around and a swim in the hot pools. That’s me back left. 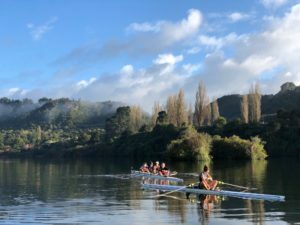 It’s cool for some of the South Island rowers who haven’t been to these before. We are now starting to prepare for the long plane trip. 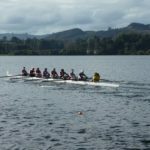 Rowing NZ is very organised and we have a detailed schedule to stick to while we fly, to help us adjust quickly to Czech time. I’ve got a lot of dehydrated tramping meals, biscuits and shepherds pies to supplement my plane food. Thank you again to everyone who has helped make this dream possible, both financially and through messages of support and help. I am very grateful and humbled to the Legion of Rowers who awarded me one of four awards last weekend. I’d also like to say a huge thank you to the Pohutukawa Coast Helping Hands Trust, who gave me a grant to get me over the line. A special thank you also to Howes and Brown Optometrist’s, who urgently replaced my one-off specially handmade prescription glasses after a mishap in the boat resulted in my only pair ending up on the bottom of Lake Karapiro. Supporting my vision to row, literally! We receive our uniform this week, and fly out on Sunday night. I will do my very best to make you all proud as we wear the silver fern! Follow us on Instagram; nzjuniors2018.